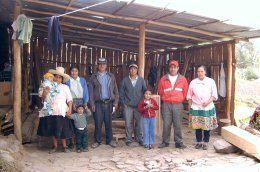 Jose Isabel Ayay, a Bright Hope partner working with the Quechua people in the Cajamarca region, submitted a project idea to start a carpentry shop. He had some land with some trees that he will use for the timber shop and he will rent a small premises to carry out the work. The shop will support Jose's missionary work and in fact enable him to do more in relation to frequency of visits to the villages he goes to and at the same time provide food for him and his family. Jose Isabel commenced as a Bright Hope partner in 2002. During that time he has come up with the project idea of a carpentry shop. This has enabled Jose Isabel to become self-funding and Bright Hope has been able to pass on Jose Isabel's previous support to a new partner. Jose Isabel Ayay and his extended family. Other missionaries in Peru. The local church. This particular project will provide financial support for three married couples directly and a local church indirectly. It will enable Jose Isabel to be self funding and to help him achieve his goals of travelling, more often, to the outlying towns and villages to evangelise. Jose Isabel is an elder in his local church in the village of Calvario, this is a Quechua speaking church. He and his family attend this church where his brother is also an elder. The church has commended Jose Isabel to evangelise and church plant in the towns and villages near to and further afield. Jose has been an elder there for longer than the time Bright Hope has known him, since 2001. Jose Isabel's family are involved in this project, his son and son-in-law run the carpentry shop. - To buy a set amount of carpentry machinery, to rent a workshop, and to mill timber. - That the project will support Jose Isabel and his family. - To provide employment for one or two people from Jose’s local church. No further funding is required to support the carpentry shop - it is now up and running and providing financial support for Jose Ayay.